Whether you are new to using LinkedIn or your current Company Page just isn’t delivering the results you expect, believe it or not – there is a light at the end of the tunnel! How is your company leveraging LinkedIn? With more than 450 million users worldwide, two new members joining every second, and a lead generation impact far beyond that of Facebook or Twitter, a company presence on LinkedIn is absolutely essential. Why creating an effective LinkedIn Company Page is a marketing must! 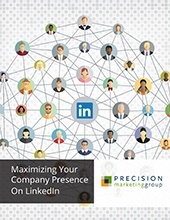 How to amplify your company’s presence via your LinkedIn network – and more! Ready to power up your LinkedIn presence? Simply fill out the form to get your free white paper – Piece of cake!